Attended by Governor State of Illinois Bruce Raunerr, President Cook County Board Toni Preckwinkle and more than 600 Chicago leaders from different organizations. 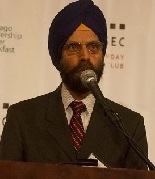 The annual Chicago Leadership Prayer Breakfast sponsored by Chicago Sunday Evening Club held at the Grand Ball Room of Chicago Hilton on Michigan Avenue on December 4, 2015 opened with a Sikh prayer of Thanksgiving. This was the first time in its 51 years of history that it included a Sikh prayer. 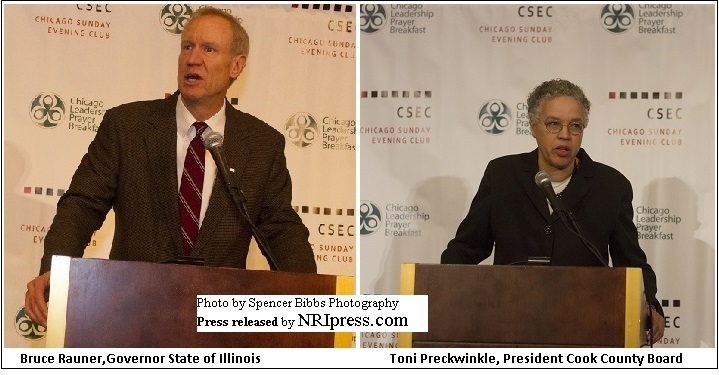 The ninety minutes long breakfast event was attended by Governor State of Illinois Bruce Rauner, First lady Diana Rauner, President Cook County Board Toni Preckwinkle and more than 600 Chicago leaders from business corporations, religious, interfaith, civic, and non-profit service organizations. The Sikh prayer was performed by Rajinder Singh Mago who prayed to the One Universal God for the well being of all humanity. Mr. Mago is a longtime volunteer coordinator of mainstream community outreach at Sikh Religious Society based in Palatine Illinois. Mr. Mago is a trustee emeritus of the Council for a Parliament of the World’s Religions founded in Chicago and also co-founder and on the board of governors of Punjabi Cultural Society of Chicago. The Sikh prayer was for Thanksgiving, Peace, and Harmony in the light of protests and turmoil taking place in Chicago where the police chief Garry McCarthy was fired that week and the protesting minority communities were demonstrating on the street demanding resignations of the Chicago Mayor Rahm Emmanuel and Cook County State's Attorney Anita Alvarez for the alleged cover up of Chicago police brutality in the cases of shooting deaths of black youths. The Master of Ceremonies at the Prayer Breakfast was David Casper, President and CEO of BMO Harris Bank. The event was underwritten by BMO Harris Bank N.A., Henry Crown and Company and Northern Trust; Benefactors Commonwealth Edison, Northwestern Medicine and PNC Bank; Patrons Baird, CBRE U.S. Equities Reality, Chicago Bulls, Robert R. McCormick Foundation and Wintrust; Table Hosts Boy scouts of America, The Salvation Army, The Field Museum, and more than 30 Chicago area business, religious, inter-religious, civic and non-profit organizations. “Profound racism continues to plague our society. It’s reflected not just in who is detained or incarcerated, but who is shot and killed by the police on our streets,” said Cook County Board President Toni Preckwinkle. “I’ve lived in Chicago for 50 years. I’ve always believed that the police could shoot and kill people with impunity.” Preckwinkle said we are surely in a time of crisis a prayer breakfast is the perfect time for a call to action. Gov. Bruce Rauner agreed that Chicago is facing a crisis. “This breakfast is occurring at one of the most important times in the history of Chicago,” he said. “We also have a breakdown today, a tragic breakdown, in the institution of public safety; a lack of faith and a lack of trust. It is the most essential element for it to function.” Rauner said some of the most essential elements to restoring that faith are prayer, communication, and coming together to find solutions. "The biggest threat to our nation is the disintegration of the family unit," added Governor Rauner. Kershner urged community leaders to transform their speech and resist language that demonizes others. “We cannot tolerate words that demean another citizen based on their race, their religion, their ethnicity, their neighborhood, their economic status, their physical abilities. We cannot sit by and abide language that barely conceals contempt for another,” she said as the room erupted in applause. Like Rauner, Kershner explained the situation’s impact on children. “Our words shape the atmosphere of our city. They shape how our children see themselves, and I guarantee the words that we use about ourselves and each other shape what (children) can imagine for their future,” she said. Prayer for Civic Leadership was led by Ellen S. Hattenbach, Vice President, Spertus Institute, Prayer for the Peace of the City by Abdur Nimeri, Senior Vice President Northern Trust, Benediction and Sending Prayer by John Manos, Regional President, Bank Financial. The musical interludes during the program were provided by The HHW Advanced Arts Chamber Choir and Alumni in Association with CPS, directed by the Grammy Award winning baritone Daniel Julius Henry Jr.
"Outwardly Sikh prayer seems to be very different. However, in terms of message, it is remarkably similar. The words are obviously in a different language, and use a completely unfamiliar series of notes. Once translated, the message of being good to one another, recognizing the wisdom of religious teachings, and becoming the best version of ourselves is nearly universal. One faith, Sikhism, is still on my bucket list to visit. I am waiting for when I can finally get out the suburbs and visit a Gurdwara," wrote a blogger at Chicago Now, who goes by the name of The Spiritual Journeyer. Chicago business and civic leaders established an annual Chicago Leadership Prayer Breakfast in 1964 for the purpose of gathering as an interfaith community to pray for the city, the nation, and the world. The Chicago Evening Club has the principal responsibility for organizing the Prayer Breakfast. The mission of the Club is to tell stories that inspire people to put their faith into action to make Chicago better. The Club creates innovative, faith-focused programming for Public Television, public radio, public events, and new media. The Club works to build lasting relationships of trust and goodwill among all citizens, with particular attention to the business community of the city. Their upcoming project is a full-length documentary for WTTW, "The Journey: Responding with Faith."